Lush Fab Glam Inspired Lifestyle For The Modern Woman: Celebrities Pregnancy Style. Black Eyed Peas singer Fergie shows off her pregnancy bump in a silver and black strapless, embellished dress. 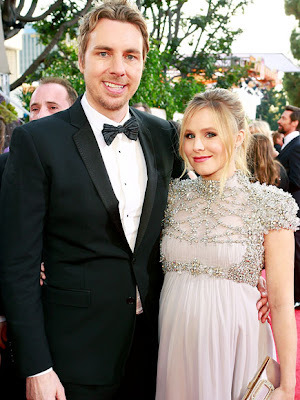 Channin Tatum's wife actress Jenna showed off her pregnancy bump in a black lace, short sleeve dress at the 2013 Oscars. Actress Joanna Garcia show off her baby bump in a strapless red dress with a ruffled skirt. Actress Malin Ackerman chose a black sequin dress with spaghetti straps to show off her baby bump. Actress Kristen Bell show off her baby bump in an pale pink flowing dress with a beaded top. Jessica Simpson who is expecting her second child shows off her pregnancy curves in a black and grey, animal print dress. Kim Kardashian who is expecting her first child with Rapper Kanye West shows off her pregnancy curves in a beige Lanvin dress with full skirt. The Saturdays singer Rochelle Humes opts for a bright pink dress and heels as she shows off her growing baby bump. Pregnancy gets your body towards the UN-smart or unshaped body, for getting rid of from this fact of pregnancy visit this babyinsider.net and get the postpartum-girdle. The postpartum-girdle helps you to maintain your body shape after pregnancy and it will get your body towards the smartness and it will also look beautiful after the birth of baby.